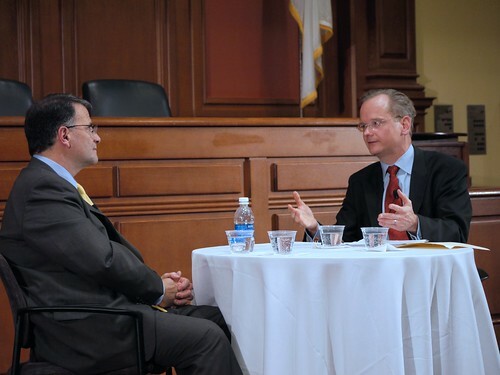 Last week I went to the first in a new series of events called “In the Dock” — Harvard Law professor Lawrence Lessig interviewed Jack Abramoff on the topic of Abramoff’s illegal lobbying in specific, and the state of corruption in US politics in general. I took some photos (CC-BY-SA 3.0), you can watch a video of the talk here, and my friend Ben Schwartz also has a write-up including some great quotes. 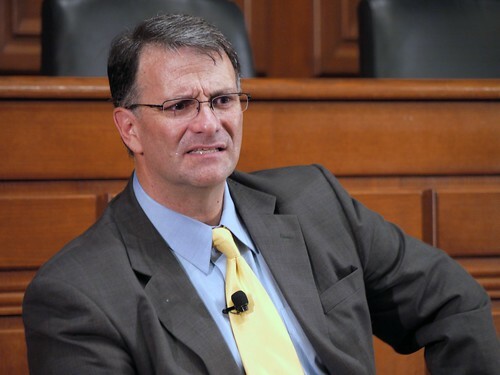 I went in willing to detest what Abramoff had done, and him by extension — and it’s not that I ended up liking or trusting him, or that I was unexpecting his “Look, you put a few guys in jail, it doesn’t mean the problem’s been solved and everything’s okay now” argument for why assigning a disproportionate amount of blame to him is unproductive, but he did manage to convince me that he’s uniquely placed to be an ally to help fix the system; that he’s someone who knows all of its intricacies and is sincere about achieving a sense of redemption by working on stopping other people from doing exactly what he did. His argument for how his book tour isn’t a cynical attempt to make money is convincing, too: to the small extent that he’s able to make money from books and speaking, he’s forced to use it to repay a $40m restitution order to the government and his victims. The most surprising thing I learned was that the crimes he went to jail for were not the particularly objectionable democracy-perverting forms of corruption that we ascribe to him — those are totally legal (even more so than before, thanks to Citizens United) and still happening today across Washington’s 30,000 lobbyists — but instead mostly unrelated charges, like mail fraud. 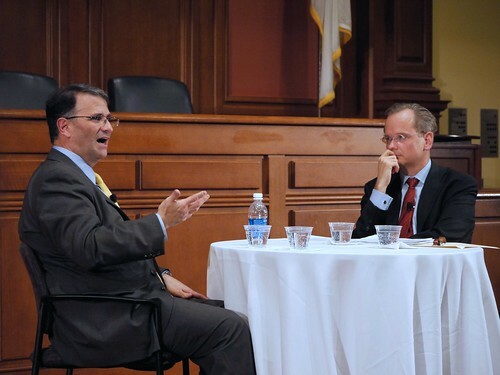 He thinks that the only way to stop bribery in Congress is to ban political contributions from anyone who stands to benefit from public funds (which Lessig criticized as being far too ambiguous and broad: who doesn’t stand to benefit from public funds? ), and to ban lawmakers and their staff from later working for lobbyists for the rest of their lives. He described how, before his downfall, he would agree to hire a lawmaker’s staffers later while they were still working for the lawmaker, and would then have control over them from that point onwards, even though no money had changed hands — not only is this movement from being congressional staff to becoming a lobbyist still legal, it’s daily routine. 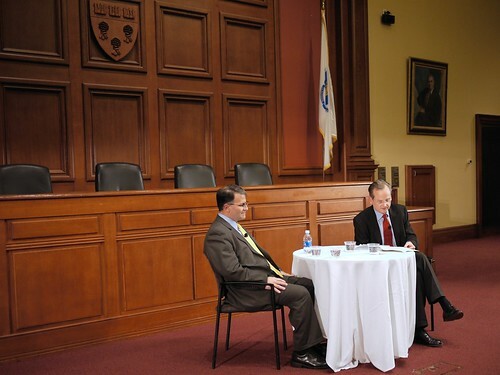 I hope this talk series continues. I can’t think of many other examples of powerful figures being brave enough to open themselves up and engage in an extended ethical (rather than legal or technical) critique and cross-examination by their peers and the public, and it was powerful to watch and learn from. Great stuff, Chris! 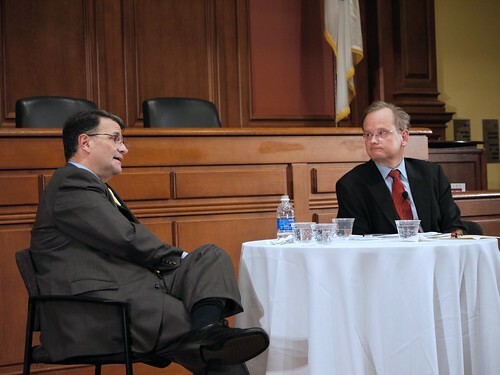 The push-back from Lessig about the first of Abramoff’s particular proposals is right-on, I think. And your more general point – that very few people put themselves through this kind of scrutiny, and that’s it’s really important and useful when they do – is absolutely right.